Features: The cell phone signal repeater supports GSM900 network, it supports any wireless operator in the frequency range of 890-960 MHz. Equipped with 9 meters 9dB Outdoor Yagi Directional Antenna, suit for areas where Wireless Operator's Mobile Network Signal is weak. Equipped with 3dB Indoor Antenna, signal coverage could reach up to to 150m2 without obstacle, it is the best choice for small house. No need to use extra accessories, just plug and use. Functions:. SKU: OT-HJWJL-1934 CDMA/PCS 850/1900MHz Repeater Frequency(MHz)： CDMA: UL:824-849 MHz DL: 869-894 MHz PCS: UL: 1850-1910 MHz DL: 1930-1990MHz gain(dB)： 65 70 Band flatness(dB)： less than 3 Output Power(dBm)： 23 27 ALC： 31 VSWR： less than 2.5 Group delay(uS)： less than 1 Impedance： 50ohm Working tempreture： -25~ 55 degree Connector type： N-Female Working voltage： AC110V~220V to DC 5V/1A Size(mm) ：190*130*23 Packing Size(mm)： 480*200*155 Net Weight(Kg)： ≈2.3KG Package includes: 1 x Dual Band Booster 1 x Power Adapter 1 x Outdoor Antenna 1 x Indoor Antenna 1 x 10 Meter Cable. Features: High gain, easy installation and operation. Full-duplex, Dual-port design. Use ALC technology, adjust extent automatically. LED Light Working & Signal Condition Indicators. Big linear power, control intermodulation & scatteration stably. Dependability stand by GB6993-86 standard. Compatibility of electromagnetism according with ETS300 609-4. CE and RoHs Approved. Specification: Frequency range : 890MHz--915MHz(Up link);935MHz--960MHz(Down link) Power: -70 ~-40 dBm/ FA (1.23MHz) Gain : (Up link) 50/55/60/65Db/±10DB (Down link) 55/60/65/70Db±10DB Signal coverage : Up to cover for 150 square meters use Impedance : 50Ω Seclusion : >65dB Power supply : 110V EU PLUG Output Voltage: 5V Compact design: Indoor use Signal Repeater Size: 140*100*20mm/5.51*3.94*0.79" Installation Approache. Wireless Communications and data transmission system Repeater. It doesn't work alone. You need a Cell Phone Signal Booster/Repeater to work with this antenna. Indoor directional coverage. What is the difference of different indoor antennas?. This is a 8dBi panel antenna for 800-2500MHz GSM/ CDMA Cell Phone Signal Booster Repeater. Maximum Input Power 150 W. 20cm cable. If we have made a mistake we will always rectify it. No exceptions. Fix up outdoor antenna reception on housetop and point to signal tower. High gain, easy installation and operation. Connect outdoor antenna to "BTS" port in repeater machine through cable. Gain : (Up link) 50/55/60/65Db/±10DB. (800~960MHz, 1710-2500MHz Omni-directional Indoor Inhale Ceiling Antenna with Type-N Female Interface for Wifi 3G GSM CDMA Signal Repeater Amplifier. 1) GSM /EGSM/ CDMA800/ 3G/ WLAN/ WiMax /AWS. • Inhale Top Antenna ensures maximum signal transfer and accurate signal load to all outlets. It is a wonderful experience and a new attitude to life. Outdoor adopt high-gain 800-960MHZ directional antenna, indoor adopt 935-960M HZ omnidirectional ceiling antenna or high gain panel antenna. Coverage area: 100-800m2 (multiple indoor antenna sets are required for large areas). Reflect the actual color of the item. I would be verry happy to assist you! shown in pictures, carefully. as on the model. 2100MHz Cell Phone Repeater. Single band 2100MHz 70dB. 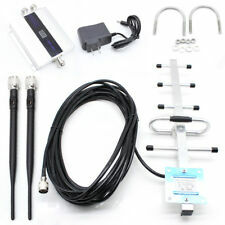 2100 MHz Cell Phone Signal Booster Repeater Amplifier With Antennas Kit. Small Size, Light Weight, Beautiful Repeater. This Single Band Repeater kit is designed for 70dB 2100Hz Band; it includes everything you need to enhance cell phone signal coverage in your location – including indoor and outdoor antennas and all hardware for installation. Indoor Pannel Antenna with wide scope of coverage distance 1500ft. Directional Indoor Pannel antenna, 120° coverage. 1x Wall Mount Pannel Indoor Antenna. Emission Designator:Emission Designator:GSM(GXW),CDMA(F9W),WCDMA(F9W),LTE(G7D). 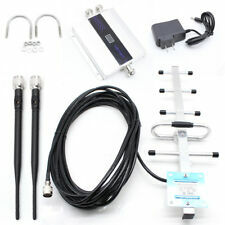 1Set LCD Family GSM 900MHz Mini Cell Phone Signal Booster Repeater. 1 piece of GSM 900mhz cellphone repeater. Repeater Function. 1 piece of indoor antenna. 1 piece of outdoor antenna. 1 User manual. The repeater device features easy installation & operation. 1 x GSM 900MHz Cellphone Repeater. So In the case we suggest you donn't buy this item. Booster Gain (dB)Gp≥58Gp≥55. Indoor Antenna Gain (dB)3. Emission Designator:Emission Designator:GSM(GXW),CDMA(F9W),WCDMA(F9W),LTE(G7D). 1x Omni Ceiling Indoor Antenna. Omni Ceiling , space saving. Indoor Ceiling Antenna with wide scope of coverage distance 1500ft. Fix up outdoor antenna reception on housetop and point to signal tower. Connect outdoor antenna to "BTS" port in repeater machine through cable. Compact design: Indoor use. 1 x Indoor antenna. LED Light Working & Signal Condition Indicators. Outdoor adopt high-gain 800-960MHZ directional antenna, indoor adopt 935-960M HZ omnidirectional ceiling antenna or high gain panel antenna. It is a wonderful experience and a new attitude to life. Coverage area: 100-800m2 (multiple indoor antenna sets are required for large areas). 1byone Indoor Cellular Antenna, Multiband Panel Antenna for GSM/3G/4G Cellphon..